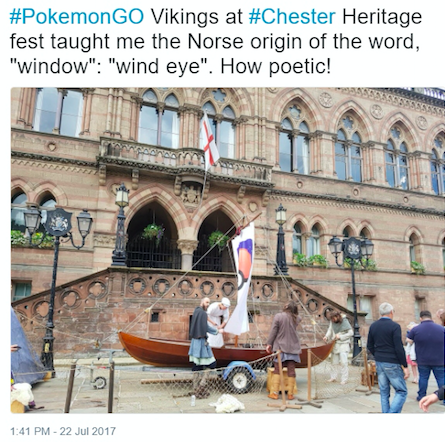 In partnership with Big Heritage, the city of Chester, England included two days of Pokémon GO social enterprise that engages museums, schools and communities with the past, approached the event through a historical lens. 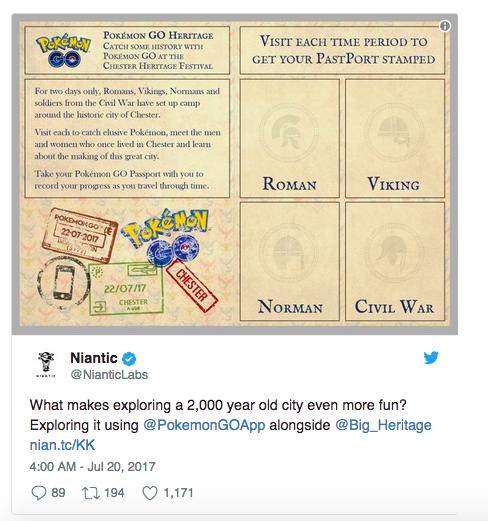 They offered antique-looking Pokémon GO maps, limited Pokémon GO History Explorer certificate, “PastPorts” to be stamped at each Pokéstop, and novel opportunities for visiting historic landmarks in their town. 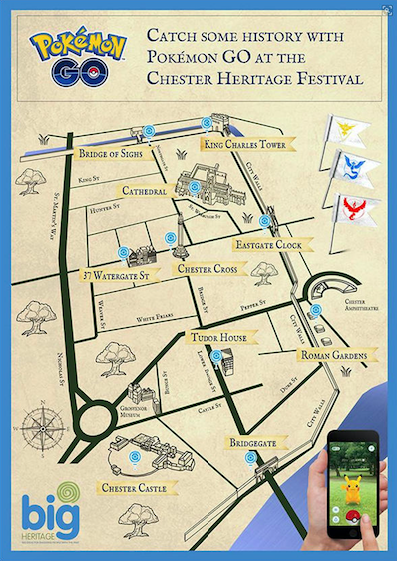 The Big Heritage Festival created a physical map that combined PokéStop locations and historical locations/events that they wished to highlight. Gym, and handful of Pokéstops. An example of the physical augmentation to the digital portions of the event. A juxtaposition of the historical physical context of the event with the digital layer. 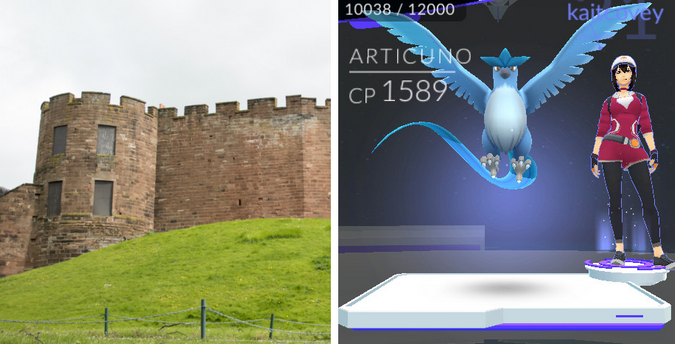 Rare ‘legendary’ birds Articuno and Lugia were released leading to mass raids at locations including the Mecca bingo roundabout. Pokémon GO face painters and musicians were available throughout the city, free for under 16s. 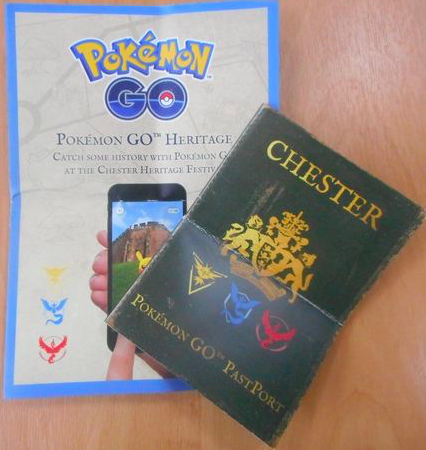 Also, promoted as the only event in the world to (so far) to do this, Chester offered Pokémon GO PastPorts for players, which were to be stamped after visiting four historic camps across the city. Event organizers created memorable physical aids to bring together Pokémon GO and history. This is the outside cover the the “PastPort” they used to guide players. The inside of the PastPort that provided activity guidance and additional interpretation to engagement with PokéStops and event locations. Following the event, Big Heritage issued a call to Pokémon GO players who completed the map challenge during the festival. These players received a certificate and unique code, which they could use to nominate a heritage or cultural Pokéstop. Suggestions included old buildings and structures, public works or art or large-scale graffiti, natural lasting landmarks, and memorials. Big Heritage’s founder stated: “to us, your opinion is as valid as anyone else’s”. The event’s Facebook Page broadcasted Raid Radio, as an attempt to attract the maximum participants at different raids throughout the city. 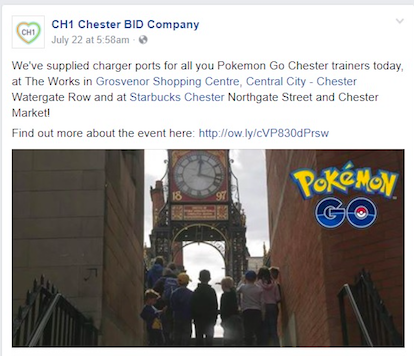 Big Heritage collaborated with schools across the Cheshire and Merseyside regions as part of an “initiative to encourage young people to explore and learn about their local area by playing Pokémon GO together.” Other “unofficial” community supports include the Riverside Innovation Center at the University of Chester, and CH1 Chester BID Company, the Business Improvement District of Chester who supplied charger ports for trainers at The Works in Grosvenor Shopping Centre, Central City – Chester Watergate Row, and at Starbucks Chester Northgate Street and Chester Market. An example of local companies benefiting from event publicity while contributing to the success of the event.